Rubber is the ideal solution for a fuel hose – it can cope with extreme chemicals and provides flexibility. However, when trying to design for both safety and space-saving, a unique challenge is presented. To design, prototype and then manufacture a flexible rubber sleeve for a fuel system. The sleeve had to be robust enough that in the event of an impact, it would stay intact. 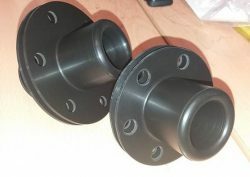 However, due to the space and packaging constraints, tolerances were extremely tight and the component could not be designed in a manner that would best suit standard rubber moulding manufacture processes. The component was successfully prototyped and is proceeding to full production. Kopter (previously Marenco Swisshelicopter) develops and builds lightweight turbine helicopters. They guarantee superior performance, safety and life cycle economics. Their aircraft are used in surveillance and law enforcement, for medical operations, utility missions and passenger transport. One of the key features of their aircraft is the next generation turbine engine, offering increased power output and reduced engine fuel consumption. During the development phase of their third-generation aircraft, Kopter approached us looking for an interface between two fuel tanks that would be flexible enough to compress or extend in the event of an impact. We were initially provided with a design concept by Kopter’s lead fuel system engineer; it had a complex geometry including a reverse convolution double-ended tube. We collaborated with the design engineers for the project; in order to manufacture tooling that would produce consistent, safety-critical parts in the appropriate material for the fuel type, we were keen to thicken the walls of the component – however this was not possible due to packaging constraints when in situ. We undertook finite element analysis (FEA) to understand how the part would perform under crash conditions and with the wall thickness that we had agreed upon. Once the design was finalised, we manufactured single-cavity tooling to product prototypes; the components were on the limit of manufacturability and the collaborative project team wanted to understand both how the tooling and material would behave with the defined geometry, and it also allowed the team to test the physical parts. It took some tooling adjustment to get the parts exactly as required, but it was achieved and the customer had fully functional parts delivered consistently from the prototype tool for testing. Those parts have now been approved for production, following what proved to be a challenging design and development project.